On my Saturday visit to the Antrim coast two weeks ago [12 November 2016], after walking through the ‘Dark Hedges’ and visiting Gracehill House, I moved on to visit Dunluce Castle, the Giant’s Causeway and the Rope Bridge at Carrick-a-Rede, three of the most popular and most-visited tourist sites in Northern Ireland. Dunluce Castle is a mediaeval ruin perched precariously on the craggy and treacherous Antrim coast in north-east Ulster. It stands on the edge of a basalt outcropping on the coast between Portballintrae and Portrush. The steep cliffs and drops beneath the castle may explain why a fort has stood on this site from early times, and the first castle on this site was built in the 13th century by Richard Óg de Burgh, 2nd Earl of Ulster. The McQuillans came from Scotland in the 1200s as hired mercenaries, and were the Lords of Route from the late 13th century. They built their castle on the cliffs around 1500, and the earliest written record of the castle dates from 1513. The earliest features of the castle are two large drum towers about 9 metres (30 feet) in diameter on the east side, both remains of the castle built by the McQuillans after becoming Lords of the Route. The McQuillan family continued to hold Dunluce Castle for nonther 55 years until it was taken by the MacDonnells, who came over from Islay in 1554. The McQuillans lost two major battles with the MacDonnells in the mid-16th century, and the McDonnells took Dunluce Castle by force in 1565 after the Battle of Orla. It is said the McDonnells covered a bog with rushes and stationed a few men on firm ground, fooling the McQuillans into charging into the bog. Dunluce Castle then became the home of the chief of the Clan MacDonnell of Antrim and the Clan MacDonald of Dunnyveg from Scotland. John Mor MacDonald of Dunluce Castle was the second son of ‘Good’ John MacDonald of Islay, Lord of the Isles, 6th chief of Clan Donald in Scotland. His mother, Princess Margaret, was a daughter of King Robert II of Scotland. In 1584, on the death of James MacDonald, the 6th chief of the Clan MacDonald of Antrim and Dunnyveg, the Antrim Glens were seized by Sorley Boy MacDonnell, one of his younger brothers. Sorley Boy rebuilt Dunluce in the Scottish style, and swore allegiance to Queen Elizabeth I. The castle also has links with the Girona, a ship in the Spanish Armada that foundered on the rocks of the Giant’s Causeway. Sorley Boy MacDonnell retrieved the cannons from the shipwreck and mounted them in the castle. The rest of the cargo was sold, and the funds raised were used to restore the castle. The dead crew of the Girona are said to have been buried in Saint Cuthbert’s graveyard. Sorley Boy’s son, Randal MacDonnell, was made 1st Earl of Antrim by King James I. Randal and his wife frequently visited the royal court in London and filled the castle with riches including curtains from Cardinal Wolsey and chairs of State. The countess is aid to have built Saint Cuthbert’s Church near the castle. It was originally thatched and the ceiling plaster was decorated with signs of the zodiac. Saint Cuthbert’s was the only church in Ireland with that name and is thought to be linked to the cult of the saint in Northumbria. Saint Cuthbert’s in Bushmills takes its name from this church in Dunluce. A local legend claims that on a stormy night in 1639, as the family was waiting for dinner, the castle kitchens next to the cliff face, along with kitchen staff, collapsed into the sea, and that Lady Antrim refused to live in the castle any longer. The legend says that only a kitchen boy survived, as he was sitting in a corner of the kitchen that did not collapse. However, the kitchen is still intact and next to the manor house, with the oven, fireplace and entry ways. It was not until the 18th century that the north wall of the castle collapsed and fell into the sea. The east, west and south walls are still standing. General Munro arrested and imprisoned the Earl of Antrim in 1642 and ransacked the castle. The Earl of Antrim returned to Dunluce Castle after 1666. One of his visitors was Oliver Plunkett, Archbishop of Armagh, who was later martyred on Tyburn Hill. Dunluce Castle was the seat of the Earls of Antrim until the MacDonnells were impoverishwd of in 1690, following the Battle of the Boyne, when Alexander MacDonnell, 3rd Earl of Antrim, supported the cause of James II. The family abandoned Dunluce Castle, moved to Glenarm Castle, and since then Dunluce Castle has deteriorated. When the MacDonnell line looked look dying out, the ttile was restored on many occasions to daughters in the family, whose husbands and sons changed their name to MacDonnell and McDonnell and the family titles were rescued from extinction at different times. Over the years parts of the castle were scavenged and used as materials for nearby buildings. Alexander Randal Mark McDonnell, 9th Earl of Antrim, still owns Dunluce Castle, but lives in Glenarm Castle. His son and heir, Randal Alexander St John McDonnell, is known as Viscount Dunluce. Dunluce Castle is managed by the Northern Irish Environment Agency. The castle appeared on the cover of Led Zeppelin’s album Houses of the Holy (1973). It is said to be the inspiration behind the royal castle of Cair Paravel in CS Lewis’s Narnia stories. In 2011, major archaeological excavations found significant remains of the lost town of Dunluce, razed to the ground during the wars of 1641. Lying beside Dunluce Castle, the town was built around 1608 by Randall MacDonnell, 1st Earl of Antrim, and predates the official Plantation of Ulster. The MacDonnells brought Scottish settlers over to found the trading town of Dunluce. The town, designed to rival Coleraine, had Scottish, Irish, English and Welsh residents, as well as people from Continental Europe. However, the town was a failure because it had no port that could be used for trading. Over the last five years, the archaeological digs have uncovered cobbled streets and stone merchants’ houses. The digs uncovered a Scottish merchant’s house, built in the first two decades of the 17th century, fronting onto the cobbled streets. The walls survive to waist height with plastered walls, an internal privy and a fireplace. The town also held a courthouse and a dungeon. The recent excavations have discovered a cobbled street stretching through the town towards the castle, with a blacksmith’s forge, as well as coins dating back to the reigns of Elizabeth I and Charles I, bone combs, dress fastenings, thimble, gaming pieces, and the stem of a wine glass. A bronze tuning pin used to tune harps suggests the presence of musicians. A 16th century Polish coin, kept as a token by the merchants, provides a reminder of the Scottish migrations to Poland. 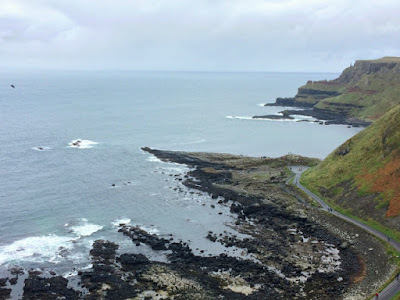 From Dunluce Castle, I moved on to Bushmills and the Giant’s Causeway, about 5 km further east. The Giant’s Causeway is an area of about 40,000 interlocking basalt columns, formed by an ancient volcanic eruption, perhaps 50 to 60 million years ago. It was declared a World Heritage Site by UNESCO in 1986, and a national nature reserve in 1987. The tops of the columns form stepping stones that lead from the cliff foot and disappear under the sea. Most of the columns are hexagonal, although there are also some with four, five, seven or eight sides. The tallest are about 12 metres (39 feet) high, and the solidified lava in the cliffs is 28 metres (92 feet) thick in places. According to legend, the columns are the remains of a causeway built by the giant Fionn mac Cumhaill (Finn MacCool), who was challenged to a fight by a rival Scottish giant Benandonner. Fionn accepted the challenge and built the causeway so that the two giants could meet. Across the sea, there are identical basalt columns, formed by the same ancient lava flow, at Fingal’s Cave on the Scottish isle of Staffa. The discovery of the Giant’s Causeway was announced to the wider world in 1693 in a paper to the Royal Society by Sir Richard Bulkeley of Trinity College Dublin, although it had been discovered a year earlier during a visit by William King, Bishop of Derry and later Archbishop of Dublin. The site received international attention when Dublin artist Susanna Drury exhibited watercolour paintings of it in 1739. The Giant’s Causeway first became popular with tourists in the 19th century. Today, much of the Giant’s Causeway and Causeway Coast World Heritage Site is owned and managed by the National Trust. The remainder of the site is owned by the Crown Estate and private landowners. Carrick-a-Rede Rope Bridge near Ballintoy is said to have been first built by salmon fishermen in 1755. The bridge crosses a chasm that is 30 metres (98 feet) deep and 20 metres (66 feet) wide and was first built by fishermen to check their salmon nets. The rope bridge links the Antrim coast and Carrick-a-Rede Island. Suspended above the rocks and the sea, the rope bridge is a popular tourist destination, attracting thousands of visitors who also come to see the Giant’s Causeway Coast and the Glens of Antrim. The bridge and the island offer uninterrupted views of Rathlin Island, the coast of Scotland and the Causeway Coast. There are views of the clear, green water flowing around the caves and caverns far below, but the challenge alone makes this a popular attraction. It is said local salmon fishermen have been building bridges to the island for over 350 years and it has taken many forms over the years. It is no longer used by fishermen during the salmon season. The season once lasted from June until September, but there are few salmon left there today. In the 1960s, almost 300 fish were caught each day, but by 2002 only 300 were caught over the whole season. In the 1970s, the bridge had only one handrail and large gaps between the slats. A new bridge, tested up to ten tonnes, was built with the help of local climbers and abseilers in 2000. Another bridge was built in 2004. The current bridge was made of wire rope and Douglas fir bridge in Belfast and was built in 2008 at a cost of over £16,000. From there we travelled along the coast on to Cushendun in the Glens of Antrim to admire the village that is the architectural creation of Clough Williams-Ellis, better known as the architect of Portmeirion in Wales. Two weeks ago [13 November 2016], while I was on a tour of the Co Antrim coast that ended in the pretty village of Cushedun, I visited the ‘Dark Hedges,’ which is one of the most photographed natural phenomena in Northern Ireland and attracts tourists from all over the world. The Dark Hedges is a quiet road near the town of Ballymoney in Co Antrim. It is just a short road surrounded by farmers’ fields, lined with beech trees whose twisted branches form an arch over the road. It has attracted photographers, painters, artists, composers and tourists for decades, and was used recently as a filming location in HBO’s epic series Game of Thrones, representing the King’s Road. The Antrim-born composer Elaine Agnew premiered her compelling Dark Hedges composition at the BBC Proms in 2012. This beautiful avenue of beech trees was planted by the Stuart family in the 18th century. They planned it as a driveway leading up to their home at Gracehill House and as a compelling landscape feature that would impress visitors as they approached the entrance to the Georgian country house. James Stuart built Gracehill House around 1775 and named it after his wife, Grace Lynd. The family planted 150 beech trees along the avenue leading up to the entrance to their house. The large estate surrounding the house dates back to the early 17th century, when King James I granted land to a cousin. King James I estates in Ireland to a family member James Stuart by royal charter. James Stuart was the king’s ambassador to the court in Turin, and the grant included lands in Co Cavan, Co Monaghan and Co Antrim. Unfortunately, the ambassador never had the opportunity to take up residence and drowned on his way to Ireland. Later in the 17th century, Brigadier-General William Stuart raised a regiment to fight for William III and fought at Derry, Aughrim, Limerick and the Boyne. Because he was never reimbursed for raising the regiment, he became impoverished him and lost most of his estate. His son James served with his father and became a colonel. Although severely wounded in battle, James and his wife Jane Irwin from Roscommon went on to have 21 children. The Co Antrim estates stayed in the Stuart family, although it was some time before they built Gracehill House. The Revd Irwin Stuart, a son of Colonel James Stuart, was ordained in the Church of Ireland and became Rector of Ballywillan and Ballyrashane, and later of Derrykeighan. He married Elizabeth McDaniel and they had six children – Christopher, James, Charles, Archibald, Elizabeth and Henry. It is not until we read of Irwin’s son James that we hear of Gracehill House being mentioned for the first time. One of these sons, James Stuart, began building the house around 1775 and named it after his wife, Grace Lynd. Later, James raised a Yeomanry Corp, the 2nd Dunluce regiment, which was heavily involved in the suppression of the 1798 rebellion. Meanwhile, Gracehill House developed a sense of grandeur, and the beech tree drive leading to the house was planted. The Revd Charles Stuart, a brother of James Stuart, stayed at home and was ordained in the Church of Ireland. Two of his sons followed in the footsteps of their military forefathers and became officers in the 39th Regiment during in the Napoleonic wars in Spain in 1813-1814. Eventually, the Stuart family left Gracehill House and settled in North America and across the globe. More recently, Gracehill House was owned by Major Windsor in 1955 who married a Chichester of Galgorm. It was bought in 1971 by the Gillian family in 1971, who turned the landscape into an 18-hole championship golf course in 1995. It changed hands once again last year . The present owners are developing the property, including an 18-hole parkland golf course and the Hedges Hotel. A favourite local story tells of the grey lady, said to glide along the Bregagh Road, sashaying between the gnarled trees. She is said to vanish from sight when she passes the last tree. Some local people say she is the ghost of a maid from Gracehill House who died in mysterious circumstances centuries ago. Others say she is the daughter of James Stuart, referred to in some genealogical accounts of the family as ‘Cross Peggy.’ Others still say she is a lost spirit from an old, deserted graveyard hidden in the fields nearby. On Hallowe’en, the forgotten graves are said to open and the Grey Lady is joined on her walk by those who were buried beside her. Today, this unique, tranquil and spell-binding tunnel of ancient beech trees stretches along the Bregagh Road, intertwining and entangling to create a spectacular fusion of light and shadow. With its mysterious and spectacular play of light and tranquillity the site has inspired visiting artists and photographers. Now known as the Dark Hedges, this tunnel remains a magnificent sight and has become one of the most photographed places in Northern Ireland. Although the branches of the trees have been pruned in recent years and the tunnel is a little less impressive than it once was, it remains a spectacular sight. The Dark Hedges Preservation Trust plans to continue preserving, enhancing and promoting the Dark Hedges for future generations, endeavouring to maintain safe access to the site for visitors and local people, and utilising the hedges as a learning tool by improving and developing interpretation around the hedges. From the Dark Hedges, it was a half-hour drive to Dunluce Castle, and from there we continued on to the Giant’s Causeway, the Carrick-a-Rede Rope Bridge and Cushendun.